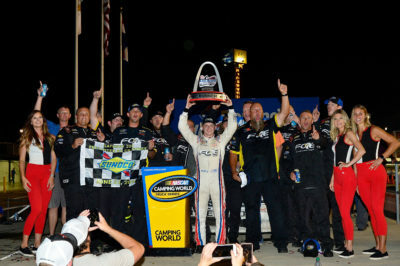 Credit: 356392(Photo by Jeff Curry/Getty Images) MADISON, IL – JUNE 23: Justin Haley, driver of the #24 Fraternal Order Of Eagles Chevrolet, celebrates with crew member after winning the NASCAR Camping World Truck Series Villa Lighting delivers the Eaton 200 at Gateway Motorsports Park on June 23, 2018. 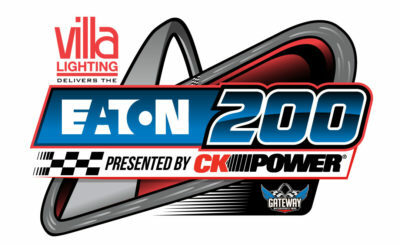 Starting from 4th place Car 24 Justin Haley Fraternal Order of Eagles Chevrolet won the 5th Annual Villa Lighting delivers the Eaton 200 presented by CK Power, his 1st win in 37 NASCAR Camping World Truck Series races. This is his 1st win & 6th Top 10 finish in 2018. This is his 1st win & 2nd Top 10 finish in 3 races at Gateway Motorsports Park. 2nd Place Car 4 Todd Gilliland Royal Canin Toyota, started from 8th place posted his 1st Top 10 finish in 2 races at Gateway Motorsports Park. It is his 4th Top 10 finish in 2018. Todd Gilliland was the highest finishing rookie. 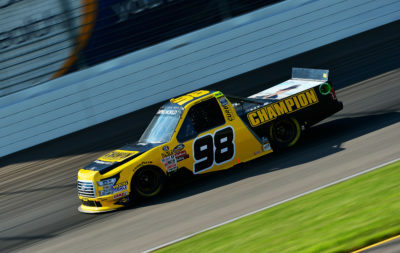 3rd Place Car 21 Johnny Sauter ISM Connect Chevrolet, started from 13th place posted his 7th Top 10 finish in 7 races at Gateway Motorsports Park. 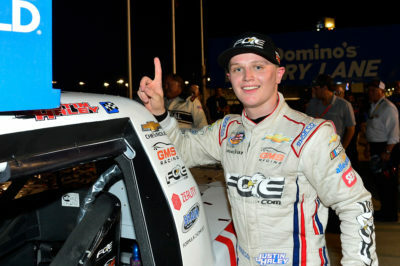 Credit: 356391(Photo by Jeff Curry/Getty Images) MADISON, IL – JUNE 23: Justin Haley, driver of the #24 Fraternal Order Of Eagles Chevrolet, poses for a photo with the winning sticker after winning the NASCAR Camping World Truck Series Villa Lighting delivers the Eaton 200 at Gateway Motorsports Park on June 23, 2018 in Madison, Illinois. 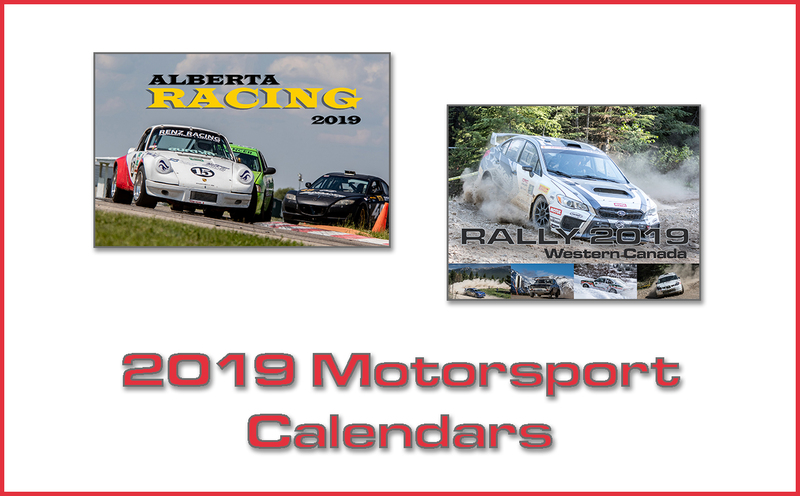 4th Place Car 13 Myatt Snider The Carolina Nut Co. Ford, started from 14th place followed by 5th place Car 54 Zane Smith Crosley Brands/LaPaz Margarita Mix Toyota, started from 10th place. 6th Place Car 42 Chad Finley Auto Value Certified Service Centers Chevrolet, started from 20th place followed by 7th place Car 97 Jesse Little Rustic Rub Co./JJL Motorsports Ford, started from 9th place. 8th Place Car 51 Riley Herbst Advance Auto Parts Toyota, started from 17th place followed by 9th place Car 2 Cody Coughlin JEGS.com Chevrolet, started from 12th place. Lastly in the Top 10 was Car 18 Noah Gragson Safelite AutoGlass Toyota, started from 3rd place. 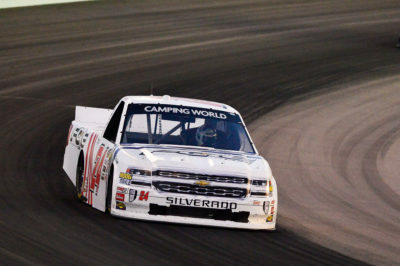 Johnny Sauter leads the point standings by 73 points over Noah Gragson. 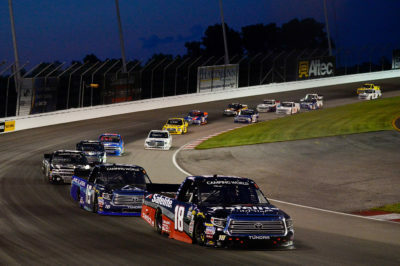 Credit: 356390(Photo by Jeff Curry/Getty Images) MADISON, IL – JUNE 23: Grant Enfinger, driver of the #98 Champion Power Equipment Ford, and Christian Eckes, driver of the #46 Mobil 1 Toyota, lead the field past the green flag to start the NASCAR Camping World Truck Series Villa Lighting delivers the Eaton 200 at Gateway Motorsports Park on June 23, 2018 in Madison, Illinois. The race had 2 Cautions for 12 Laps: 1st Caution on lap 24 for #3 Stopped in Turn 2, Refired. 2nd Caution on lap 34 for #25 Crash/ Stage 1 Conclusion. 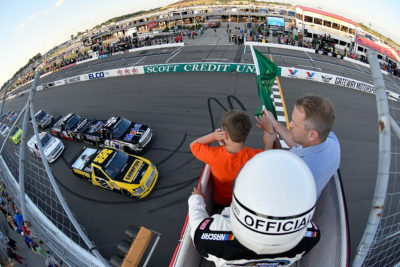 Credit: 356393(Photo by Jeff Curry/Getty Images) MADISON, IL – JUNE 23: Justin Haley, driver of the #24 Fraternal Order Of Eagles Chevrolet, drives during the NASCAR Camping World Truck Series Villa Lighting delivers the Eaton 200 at Gateway Motorsports Park on June 23, 2018 in Madison, Illinois. 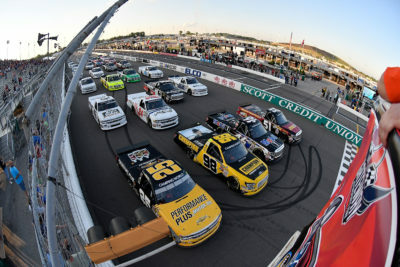 The race had 7 Lead Changes among 7 drivers: G. Enfinger 1-36; C. Eckes 37-70; T. Gilliland # 71; N. Gragson 72-81; B. Moffitt 82-99; J. Nemechek(i) 100; N. Gragson 101-153; J. Haley 154-160.
Credit: 356389(Photo by Jeff Curry/Getty Images) MADISON, IL – JUNE 23: Noah Gragson, driver of the #18 Safelite Auto Glass Toyota, leads a pack of trucks during the NASCAR Camping World Truck Series Villa Lighting delivers the Eaton 200 at Gateway Motorsports Park on June 23, 2018 in Madison, Illinois. Credit: 356388(Photo by Jeff Curry/Getty Images) MADISON, IL – JUNE 23: Dalton Sargeant, driver of the #25 Performance Plus Motor Oil Chevrolet, Grant Enfinger, driver of the #98 Champion Power Equipment Ford, Christian Eckes, driver of the #46 Mobil 1 Toyota, and Riley Herbst, driver of the #51 Advance Auto Parts Toyota, lead the pack for a four wide military salute on a pace lap prior to the start of the NASCAR Camping World Truck Series Villa Lighting delivers the Eaton 200 at Gateway Motorsports Park on June 23, 2018 in Madison, Illinois. Race Comments: Prior to the start of the race, the following trucks dropped to the rear of the field for the reason indicated: No. 33 (unapproved adjustments), No. 41 (backup truck), No. 87 (pitting before the green). Failed to Qualify: (2) 74 BJ McLeod(i), 0 Camden Murphy. Time of Race: 02 Hrs, 20 Mins, 38 Secs. Average Speed: 85.328 MPH. Margin of Victory: 0.753 Seconds. Caution Flags: 9 for 53 laps. Lead Changes: 7 among 7 drivers. Duralast GT Brakes ?Brake in the Race Award? – Stage 1: Grant Enfinger, #98 Stage 1. Duralast GT Brakes ?Brake in the Race Award? – Stage 2: Christian Eckes, #46 Stage 2. Mahle Clevite Engine Builder of the Race: Ilmor Engines (IE), #24. Mobil 1 Driver of the Race: Justin Haley, #24. Sunoco Rookie of the Race: Todd Gilliland, #4.